Modular toilet hire is suitable for confined spaces, constructions sites, high-rise buildings. The modular toilet offers an ideal solution for confined or restricted access. Installed by one person and easily re-located by two people, the modular toilet hire can be serviced weekly or just hired for a day or longer period. 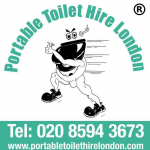 Contact our dedicated team at Portable Toilet Hire London to discuss your confined toilet hire requirements. Should you require the more traditional portable toilet, speak to a member of our team on 020 8594 3673.